For roughly an hour on Tuesday afternoon, hell froze over in New York City. Mortal enemies Andrew Cuomo and Bill de Blasio grinned side by side at a press conference heralding the arrival of one half of Amazon’s promised “HQ2” in Long Island City, Queens. Amazon will be receiving a cash subsidy of approximately $3 billion over at least ten years, through $1.7 billion worth of New York state government grants and tax credits alongside $1.3 billion from the city. The company is, in turn, promising to create 25,000 jobs averaging salaries of $150,000 each, in at least 4 million square feet of real estate. The company already employs about 4,700 people in the five boroughs. The estimated cost to the state and city governments of each job created by the deal is $48,000 apiece. 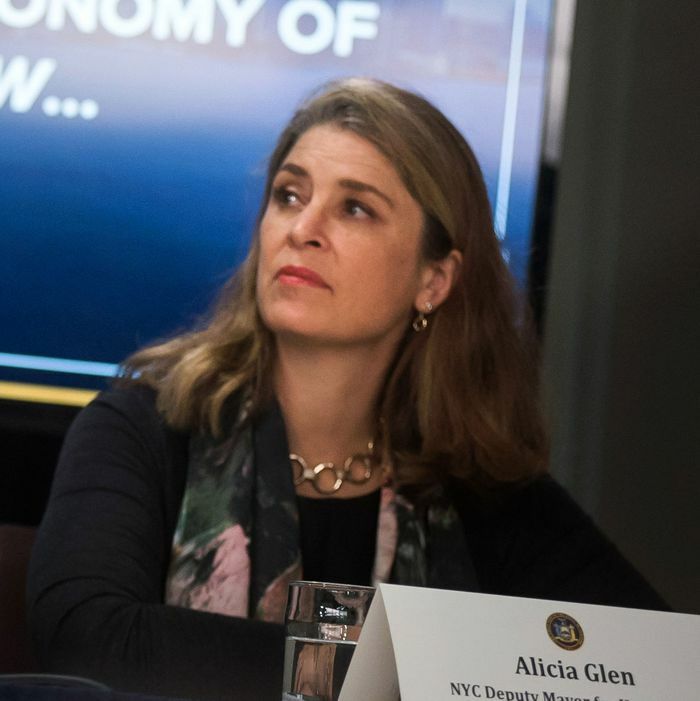 The person most responsible for the HQ2 deal from the New York City government is Alicia Glen, the New York City’s deputy mayor for housing and economic development. Formerly the chief of Goldman Sachs’ Urban Investment Group, Glen is the de Blasio administration’s point person for the Amazon HQ2 announcement. In a phone interview with Intelligencer, Glen described the deal as incredible bargain for the city, one that will provide thousands of high-paying jobs that would otherwise been unavailable to New Yorkers. “The most important things with respect to the development project is that we get the public benefits that are important for all New Yorkers,” Glen said. The deputy mayor also pushed back on criticism of the deal, which will not go up for a vote before the City Council, as an end run around the democratic process. “The governor and the mayor were both elected by overwhelming majorities, to say that this isn’t a democratic process is sort of, I think, a misinterpretation of what’s going on,” Glen argued. You can read the full interview with Deputy Mayor Glen below, edited for length and clarity. ﻿From the moment that this competition was announced, it seemed that the two places that Amazon would most likely end up were New York or Virginia. The competition just ended in this big way, and Amazon is going to … New York and Virginia. Do you think that this was an effective or fair way for Amazon to conduct a search for its new headquarters? ﻿Well, first of all I just want to challenge your initial assertion, which was that it was always gonna be New York and Virginia. I mean, quite the contrary. If you go back and look at the press from when this whole competition began and you actually look at the bookies in Vegas, New York was at about 100:1 on a good day, so that, to me, is actually sort of inverted. Nobody I know, and nobody really in the mainstream press — maybe New York Magazine had a different view, but I don’t want to challenge you; I bet you you were consistent with everybody else — absolutely nobody thought New York City was going to be even close to being a finalist. And I know we said to everybody, “Wow, you’re really misinterpreting what I think New York City has to offer in terms of being a place where a growing, diversified technology and innovation company wants to be,” because any company that really wants to be in all of the various parts of the tech and innovation world is gonna wanna be in New York City, because we have the most diverse economy, right? If you’re in the film business, the television business, the cloud business, the pure tech business, the food business, the clothing business, right? All the businesses that Amazon is in and will be growing. All of those industries are already here, and so I always said to everybody, I think you guys are missing the point. New York City is the only place that has the diversity of talents and sectors that are gonna be able to feed this company as they grow. Well, I think the answer to that is that the city and the state of New York produced a pretty substantial package of benefits that brought Amazon and made it feel comfortable to enter a place like New York. Do you believe that these benefits were required? Do you think that it’s in the best interest of the city and the state to be negotiating these kinds of packages to bring companies to town? So that’s number one. Number two is that any opportunity to get 25,000 new high-paying jobs, for us not to engage in conversations about what would make that make sense for a company to come to New York would be irresponsible. So New York City’s view, and I think this is absolutely correct, is that our best role in that is to identify the places and the talents for each company. And so our focus, all along, was on trying to find locations in the city that would make sense for that kind of large-scale job growth. We had a policy and continue to have a policy that we want to attract new jobs and high-paying jobs, particularly in the areas outside of the core, right? We want to be a five-borough economy. We don’t want to be a hub-and-spoke economy. We plan to involve investments in places like Brooklyn and Queens and the Bronx to have more jobs. So our view of it is, if we can put together a bid and lead the horse to water then that would be an unbelievable boon, to not just New York City as a whole but also to our whole job-diversification strategy. So the things that we focused on were showing them sites where they could have places where people could walk to work or live in different places and not be in the middle of the city. Places where we have targeted our infrastructure investment in order to incentivize and encourage folks to go to places like Brooklyn and Queens, and by the way, those places have, as of right now, incentives that are available to any company. So it’s not that we put together a package specifically for Amazon. You know, Joe Schmoe Pencil Making Company, if they locate outside of the borough of Manhattan they get the same REAP benefits, per person, that Amazon gets. The Brookings Institution, for instance, says that these kinds of packages, in aggregate, amount to a kind of race to the bottom and don’t necessarily yield the kinds of results that we want. Companies often renege on these kinds of agreements. ﻿I believe there are some companies and some states where that has happened. You don’t get the $3,000 a person, per employee, REAP benefit if the person isn’t working there, and we can verify that, and we have fallbacks. I mean, we’re not dumb. We know how to do these deals, and I think you could absolutely have a legitimate conversation as to what should cities be providing to lay the right seeds for growth. But in a way, that’s not the debate we’re having on Amazon because those two programs — the ICAP program, which gives them an abatement off their real-estate taxes for building or improving buildings, and REAP, which is a per-person employee benefit — are in state law. Those have been debated and will continue to be debated in the legislature, and by the way, we’ve been big proponents of we need to reevaluate those programs constantly, right? Because the world does change. So I think that those are fair questions, but that shouldn’t be confused with a state like New Jersey offering $7 billion to build a $5 billion campus, right? I mean, that’s just crazy. And Maryland made the same exact number and offer, and Pennsylvania’s package was even more substantial than New York’s. ﻿Right. So it’s like, it wasn’t a race to the bottom. If it was a race to the bottom they would have gone to one of those places. Wait, so you need to disaggregate those two things. One, if there’s anybody who thinks that creating more jobs that pay a lot of money, if that’s a bad thing, then we’ve really lost the forest for the trees. It’s not that it’s a bad thing, it’s that it’s a mixed bag. No, I think the issue is a struggle and the work is to make sure that people who have not traditionally had access to those kinds of jobs have access to those jobs, and I think people really need to be clear about those two things. I’ll get to the sort of secondary job impact in a second. One of the things that it so amazing about New York and why this really matters is that people who work in the tech ecosystem or tech sector in New York right now, 47 percent of those folks are foreign-born. Forty percent of those people are women, okay? I challenge anybody to go up against that and say that there is not something good and important about inclusiveness and all the diversity issues that matter and should matter and define New York. We are bringing a company here which will, by definition, by being in New York City, and being spoon-fed an amazing, diverse bunch of people, that that is not equitable and smart for us. That is a different issue, and probably not everybody can make $150,000. That’s true. Some people who are in different divisions will maybe start out at $50-60,000, so I don’t know too many people in this town who are not highly educated professional class who would say, “Go.” Like, I go to these things at CUNY and all of these amazing things that we sponsor, and if those kids who come out of Queens College know that they have an opportunity to work at Amazon and make 70, 80, 90, $100,000 a year as a starting salary, who is gonna say that’s a bad thing? That’s crazy. Is there something in the deal about who gets to take those jobs? We have no statutory authority to require local hiring. That’s another thing people need to understand. You cannot require a company to hire locally. What we have done, and what we will continue to do, is build those pipes. And again, go back to why they’re here to begin with. They can’t find that many other people in Seattle and on the West Coast; that’s why they want to come here to begin with, and so when we were working with them, when they were in this final stage and in the 20 cities, I think one of the things that really tipped it in our favor is that we have this incredible diversity of public and private universities. We’re just funding another ten full time computer science professors at Hunter College ‘cause they have the highest number of women and minority computer science majors anywhere. And you could just see how that was exactly what they’re coming here to do. We will work with them to continue to make sure that pipes are as strong as they can possibly be, but […] we do not have statutory authority to require a company to hire any particular individual. Is there anything that you’d be able to do to mitigate it, if it turns out that a lot of these jobs won’t necessarily go to local folks, and the cost of living continues to increase, and so on? I think that that is a legitimate question, but I think it’s a question that I don’t believe we are gonna have to answer because, again, their absolute number-one issue — and, by the way, it’s the same issue with Google and Facebook and all activity that’s swirling around the tech sector in New York City — is their need to identify new pools of talent. Fresh talent, right? There’s only so many people who go MIT or […] Caltech. Not only do they need to identify different pools of talent, for their own business purposes they want to identify and have a different kind of workforce [that] more accurately reflect[s] the products and services they’re continuing to build out. So, are we gonna be the jobs police? No. We can’t be the jobs police, nor should we be. We should, as smart government officials and people in the public sector, continue to make sure that we are producing those kids, [that fresh talent], right? And that’s why it matters that we’re doing computer science for all in New York City public schools. It’s why we’re funding CUNY. It’s why we’re funding a lot of these different kinds of bootcamps that reach nontraditional populations. We have to be held accountable for our end of the bargain, but I really believe that if we can serve up all these great New Yorkers, they are gonna be easily absorbed into Amazon. Not just the Amazon workforce, but again, all the spin-off activity that’s gonna come from it. We’re already seeing that from [the Jacobs Technion-Cornell Institute]. You know, there’s 300 young women programmers being trained at Cornell Tech right now through a program at CUNY, and all 300 of those women now have the kind of internship[s] that my kids, who go to fancy schools, would kill themselves to have, because we’ve created those direct pipelines between places like CUNY and Google and Facebook, and now Amazon. ﻿Yes, the PILOT is the exact same amount they would pay if they were paying taxes. ﻿And sometimes PILOT does not match the taxes, but just so everybody understands, and I had to explain this at the press conference yesterday: The PILOT schedule here is exactly the same as if they were actually paying taxes. Sometimes PILOT [is] different; this is not, so whatever the taxes are, [it’s] like if they had to write a check. Same effect. Right, it’s the same number, it’s just it’s written differently. So half of the PILOTs are going into a fund for infrastructure development in the area. This is a little bit of a version of value capture, right? This is the whole debate about value capture, which is, because the companies and the buildings will be there, creating incremental value, we can take some of that incremental value that otherwise wouldn’t be there and plow it right back into the neighborhood. It’s not for the Amazon campus; they’re responsible for all of the infrastructure on their campus. This is very similar to what we did in east midtown, trying to identify a mechanism through which the community will know that there will be money set aside for the neighborhood, right? Despite what might happen in the regular budgeting process. And that’s always a careful balancing act, which is why we decided we’re proposing — and the PILOT agreement hasn’t been signed yet — that 50 percent of the money would go directly into the fund, which would allow [for] community impact, community input around what kinds of projects would make sense, and the remaining 50 percent would go back into the general funds. The PILOT funding is one thing, but in addition, there’s the question of whether or not the current infrastructure and housing accommodations can support all of these new employees and all of these new developments. What is the city planning? ﻿So, you know, our entire economic development and capital planning strategy is based around investing in neighborhoods that are well-placed for equitable growth, right? And it makes sense, so even if we were not doing this Amazon deal, we are going to be making fairly large infrastructure investments in the Long Island City neighborhood anyway, because they have been undergoing such a substantial period of growth, and also change in use. So one of the big issues in Long Island City was, “Oh my god, so many people have moved here. We need more schools.” One of the great things about the Amazon deal, for example, is that we’re repurposing 4 million square feet that was slated basically for residential development, to have that be a commercial development. A much more thoughtful, mixed-use environment, and so although having development creates some infrastructure pressure, this kind of development also relieves other kinds of infrastructure challenges. So we’re going to continue, through our regular capital budgeting process, and in ten years we’ll be releasing our next ten-year capital strategy, we’re gonna continue to make infrastructure investments, and that will be in addition to the separate pot of money that begins to accrue once the pilot payments kick in. It’s not like we’re cannibalizing one for the other. It’s really meant here to say, “This is a part of New York City that is gonna really grow.” We want it to grow in a sustainable and thoughtful way, so we need to focus our capital on it, but we also need to be cognizant of the fact that we can create a special mechanism. The state, their main job is to focus more on the 7 line and the other MTA critical connections there, and we believe that they should prioritize them in the MTA capital plan. We’re not gonna rely on that, right? We’re gonna continue to run more ferries. The BQX now becomes more relevant than ever in terms of providing borough-to-borough access. But I do think that the state’s major role here in terms of dealing not just with Amazon but with what’s going on around Long Island City [at] large, is to more specifically focus on service improvements on the MTA line. So with the MTA line, it sounds from how you’re describing it like there’s a path in front of them that they could choose to go down to help strengthen these things, but it’s not an obligation and it’s not codified? ﻿That’s correct, and I don’t know if you report on or follow the MTA capital planning process, but [for] the first three or four years, folks who are gonna be working at Amazon are gonna be working at 1 Court Square, on top of four subway lines, and all they’re doing is replacing the people who used to be working there from Citibank. That initial tranche, if you will, of workers is not gonna force the question. I think that it’s a legitimate debate and people have been talking about this a lot as to how the MTA prioritizes their capital budget, and the mayor and our board members have made very clear that we should have a bigger say in how the MTA’s capital plan is directed, and we would argue that the city’s subway system does not get its proportional share of capital investment relative to suburban lines. That’s a well-known fact and/or argument, and we will continue to impress [that] upon the MTA. I think the governor, with this investment in Amazon — in some ways this is an endorsement of the fact that they’re going to have to do more to make transportation even better in this part of the Queens. One of the other concerns that’s been raised is about whether Amazon is a reliable corporate partner for local governments to work with. They’ve cracked down aggressively on unionization throughout their contract workforce. There is a lot of concern about some of these contracts and activities with the Defense Department. Some of these are obviously not the purview of the city government, but I think they speak to the character of the company and make a lot of people apprehensive about whether or not the city government should work with them. Have you found any reason to be concerned about Amazon’s ethical and broader corporate practices, and is there any hesitation on your part about collaborating so closely with them on such a significant development project? ﻿I think that’s a really hard question to answer because we at the negotiating level, at the city level, we haven’t found them to not be, quote, “good partners.” Again, I don’t know exactly what you mean by that question. The broader debate about their labor practices, as you point out, is a complex federal matter, and I think we were, I know we were … “happy” is probably not the right word … Pleased, to see their movement on voluntary minimum wage, is, I guess, the correct word, when they, in many jurisdictions where the minimum wage wasn’t getting anywhere near to $15, they decided to [make it] that. As you know, we, here, have a state minimum wage and a city minimum wage. For us, the most important things with respect to the development project is that we get the public benefits that are important for all New Yorkers, that this isn’t a closed campus, and that they [don’t] become a gated community — that was absolutely never on the table, and we’ve made very clear that this has to be [symbiotic with] the urban environment and that this is a place for everybody, and that’s why we insisted that they keep the same plans that we had for the waterfront, investing in a waterfront park, ensuring we have industrial pipe, that we activated the waterways so that regular, everyday New Yorkers can walk through a building where there are Amazon employees and go get in a kayak for a dollar. We’re very clear that there is nothing [in] being Amazon that doesn’t make you like every other corporate tenant who we want to welcome […] to our city, […] you also have to play by the rules. And that’s why those rules are [granting them] the same benefits any other company would be able to get if [they] were in this location. Those are the things that I think are getting lost, and those buildings are gonna be built with union labor. Those buildings are gonna be staffed by building service workers who are union workers, and generally the kind of [workers] that are in the buildings are not unionized workers so that isn’t really an issue. This won’t have to go before the city council, and there won’t be a broader vote on this, because it’s going through the — the acronym is escaping me. ﻿The plan is to do a GPP through ESPC’s authority. And so some people are saying this is an end-run around the democratic process. Would you say that this is a fair and appropriate thing for a government agency to do without this going before the city council? Let alone a referendum. ﻿Wow. I do hope that we don’t think that the best way to run a city is to have a referendum on everybody who wants to build a building. I think that presents a lot of challenges in terms of growing an economy and building affordable housing and siting shelters and doing all the things that government should do. Absolutely. But what about a city council vote? GPPs are used in very specific instances, where you have public and private sites where you have a user or a compelling public purpose with a legitimate timeline that has to be met, and this meets all those criteria. And the governor and the mayor were both elected by overwhelming majorities _ to say that this isn’t a democratic process is sort of, I think, a misinterpretation of what’s going on, and the GPP, and the statue, requires there to be an environmental review, here. There will be plenty of opportunities for comments and engagement, [and] the city planning department here will be making very specific comments and recommendations on the GPP. So it’s not like behind closed doors people are gonna take a map and just do some crazy rezoning. There’s a lot of back and forth. Sorry, what do you mean when you say “signed the letter”? All the politicians that I have read in the paper today who are complaining about the quote “secrecy” of the process to get to the announcement are the same people who signed a letter in support of the bid when they were made aware that the entire process going forward was going to be held in close confidence and that they would not be able to share details. I understand everybody has to do what they have to do politically, but just, please. Please. Those folks knew that this process was going to be a closely held process, that it was gonna be done in confidence, that it was not going to be a process where everybody got to weigh in, and they signed that letter. Everybody enthusiastically wanted us to be part of this process, and now we’re sharing everything and now we’re gonna continue to engage with folks. So nobody’s trying to pull the wool over anybody’s eyes. I guess I’m trying to understand whether or not the mayor’s office and the city and the state are comfortable with the pushback. People seem really upset about this. Do you think they have a reason to be? ﻿I think that the day after any big development project is announced in New York City, people, generally, who dislike things, are more vocal than people who like things, right? And that is the history of New York City. Do people have legitimate questions and concerns? Of course they do. The mechanisms through which we are going to allow this project to move forward are the right mechanisms for a project of this scale, this complexity, and where the benefits to the city at large are so clear in terms of new jobs. New developments that will activate the waterfront in a way that will become an unbelievable amenity to New Yorkers. My stepmother was the first president of Queens West Development Corporation, and I remember so vividly as a young person sitting at home watching her frustration [at] how hard it was to get anybody to think that you could take this incredibly dilapidated, under-utilized, quite dangerous waterfront and get anybody to think about putting jobs and housing and parks and kayaks [there]. This is an enormous endorsement of how far we’ve come in New York, and we’re going to build this out in a way that is inclusive, and we’re gonna have more affordable housing here than [on] any other part of the waterfront in the city of New York. This is a great moment for New York City, and I think that that kind of moment can go through its planning process as we have now decided to [do] because we have to get this right. This has to happen. It’s the right thing for New York. ﻿Yep, I know about that. — and they got a large tax incentive. Well, here’s the big difference between us and Seattle and the Bay Area. The Bay Area — and this is not to criticize any individual politician or person in the Bay Area — but the Bay Area had ample opportunity over the past 10 to 15 years to put together a housing plan, to be pro-growth, to ensure permanent affordability, to build workforce housing, to build supportive housing. They chose not to do that. We’ve chosen to do the opposite. For the past four years, we have been the leader in affordable housing policy, if not in the country, in the goddamn world, and we came here and we doubled and tripled down on that. We have built more affordable housing, preserved more affordable housing, and not just affordable housing but making sure that in every growth area there is commensurate increase in permanent affordable housing. No other jurisdiction has done that. You can buy your way out of it, or people can just not build it at all. We have fundamentally changed the game, and so the lessons and the issues that are legitimately making people freak out on the West Coast simply don’t apply here. And I really think people need to understand that. We’ve been in this business of equitable growth and supporting a healthy housing market for decades. Is it perfect? Have we solved it all? Of course not. That’s the hard work we have to engage in whether we have Amazon or not, and I really think people need to take that away. And I agree with this guy in Seattle. Other cities that are growing their tech workforce need to get with the program and get an affordable housing program and plow back some of those profits into affordable housing. We’ve done it. We know how to do it. We’re happy to teach you how to do it. I guess the apprehension that people have, though, is that while there’s been a real affordable housing plan in New York City, there’s lots of displacement, and there’s a lot of anxiety about that. Do you think that plans like this can coexist along with a future in which more New Yorkers are able to stay in their homes? ﻿Absolutely, and if we don’t continue to grow our economy and grow our workforce, we won’t be able to continue to pay for all the good stuff we do. And by the way, we also [have] a situation where more New Yorkers are at higher-paying jobs, [so] that we don’t have to build as much affordable housing, right? There are two sides of this equation, and if 20,000 New Yorkers who otherwise wouldn’t have had a chance to be in tech jobs get these tech jobs and can participate in a broader housing market, then that’s 20,000 more people and families — I guess it would be 20,000 times however big their family-size is — who are able to participate in the housing market, so that we can target our resources on folks who really are vulnerable, like seniors and people who have real substance abuse or other mental health issues. We want [for people to be able to] to income up. By the way, rents are dropping as this begins to shake out a little bit. It’s not gonna happen overnight. We [have] got to fight on both ends. You [have] got to fight for high-quality jobs and make sure that New Yorkers have them, while you’re also still plowing back resources that we’re able to generate by having these tech companies in town into exactly the kinds of issues that are there. You’ve got to be able to do both. You can’t do one without the other. Okay. Do you have any plans or do you know of any people who, since the announcement on Tuesday, are thinking about picking up and moving to Long Island City? ﻿Do I know anybody who’s gonna move to Long Island City? ﻿I’ve been known to go drink there. I’ve been known to go drink there. I don’t want to give away my watering hole. I have been known to go drink and eat there. There are some pretty great places to eat there. I personally don’t know anybody who’s planning to move to Long Island City. I know a lot of people who already live in the neighborhood and adjacent neighborhoods, but I think it’s an exciting moment and I think that people should be excited for New York and be excited for what New York plans for. I think there are a lot of people who would have said, five years ago, “Wow, when you have a progressive government coming in after a pro-business government,” that we wouldn’t be able to grow the economy the way we have, and we wouldn’t be able to attract a company like Amazon, which is gonna be part of the future, and we have to be part of the future, and it’s a real, real endorsement for the values of New Yorkers that they’re coming here. In May, gambling portal Sports Betting Dime gave Northern Virginia and D.C. four-to-one and five-to-one odds, compared to New York City’s 60-to-one, Austin’s six-to-one, and Newark’s 100-to-one odds. New York City’s Relocation and Employment Assistance Program (REAP) entices businesses outside NYC or below 96th Street in Manhattan to move above 96th or to one of the other four boroughs, in exchange for a business income-tax credits of $3,000 per employee for 12 years. In January, a group of nearly 100 academics and lawmakers — including a Brookings vice-president and the former U.S. Secretary of Labor — encouraged cities to sign a “nonaggression pact” in the search for Amazon’s HQ2: “This use of Amazon’s market power to extract incentives from local and state governments is rent-seeking and anticompetitive. It is in the public interest to resist such behavior and not play into or enable it.” New York City’s Industrial & Commercial Abatement Program (ICAP) provides property-tax abatements for property owners who “built, modernized, expanded, or otherwise physically improved” their property. Eligible areas include the Garment District, most of the South Bronx, most of Brooklyn, and the north shore of Staten Island. In 2010, then-Mayor Bloomberg announced that the city was looking for a university to build a research institute on Roosevelt Island, offering 12 acres of real estate at effectively no cost, and $100 million in infrastructure upgrades. In partnership with Technion-Israel Institute of Technology, Cornell won, and in 2017, Cornell Tech opened with 30 faculty members and almost 300 grad students in seven master’s programs. The city estimated that the new campus would create 8,000 permanent jobs and more than $23 billion in economic activity over a 35-year period. States often use payment in lieu of taxes (PILOT) programs for large-scale renewable-energy projects. A PILOT agreement reduces the tax burden and uncertainty on the property owner, while preserving some of the revenue that would have come in through property taxes. Value capture is a form of public financing that attempts to recover some of the revenue that public infrastructure creates for private landowners. For example, a city invests in a new train station: private capital clusters around the hub, then the city lays special taxes and fees on the private buildings to reroute funds back to the initial infrastructure cost. Two sites on the future Amazon campus were originally slated for 1,500 units of affordable housing, and look likely to be cut — counter to Bill de Blasio’s goal to expand the city’s stock of lower-middle and middle-income housing. “The fact that massive public subsidies are helping eliminate affordable-housing units is just the latest reason this bad deal needs to be torn up and thrown away,” said Michael Gianaris, who represents Long Island City in the New York State Senate.